What is Cubital Tunnel Syndrome? Cubital tunnel syndrome is a condition brought on by increased pressure on the ulnar nerve at the elbow. 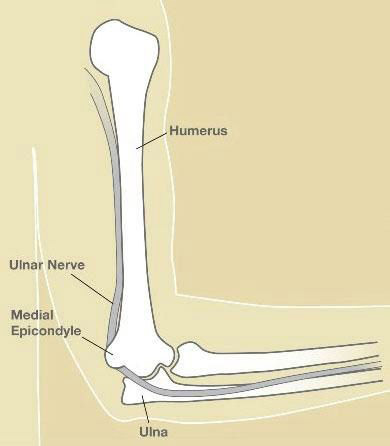 There is a bump of bone on the inner portion of the elbow (medial epicondyle) under which the ulnar nerve passes. This site is commonly called the “funny bone” (see Figure 1). At this site, the ulnar nerve lies directly next to the bone and is susceptible to pressure. When the pressure on the nerve becomes great enough to disturb the way the nerve works, then numbness, tingling, and pain may be felt in the elbow, forearm, hand, and/or fingers. What causes Cubital Tunnel Syndrome? Pressure on the ulnar nerve at the elbow can develop in several ways. The nerve is positioned right next to the bone and has very little padding over it, so pressure on this can put pressure on the nerve. For example, if you lean your arm against a table on the inner part of the elbow, your arm may fall asleep and be painful from sustained pressure on the ulnar nerve. If this occurs repetitively, the numbness and pain may be more persistent. In some patients, the ulnar nerve at the elbow clicks back and forth over the bony bump (medial epicondyle) as the elbow is bent and straightened. If this occurs repetitively, the nerve may be significantly irritated. Additionally, pressure on the ulnar nerve can occur from holding the elbow in a bent position for a long time, which stretches the nerve across the medial epicondyle. Such sustained bending of the elbow may tend to occur during sleep. Sometimes the connective tissue over the nerve becomes thicker, or there may be variations of the muscle structure over the nerve at the elbow that cause pressure on the nerve. Cubital tunnel syndrome occurs when the pressure on the nerve is significant enough, and sustained enough, to disturb the way the ulnar nerve works. Signs and symptoms of Cubital Tunnel Syndrome Cubital tunnel syndrome symptoms usually include pain, numbness, and/or tingling. The numbness or tingling most often occurs in the ring and little fingers. The symptoms are usually felt when there is pressure on the nerve, such as sitting with the elbow on an arm rest, or with repetitive elbow bending and straightening. Often symptoms will be felt when the elbow is held in a bent position for a period of time, such as when holding the phone, or while sleeping. Some patients may notice weakness while pinching, occasional clumsiness, and/or a tendency to drop things. In severe cases, sensation may be lost and the muscles in the hand may lose bulk and strength. Diagnosis of Cubital Tunnel Syndrome Your physician will assess the pattern and distribution of your symptoms, and examine for muscle weakness, irritability of the nerve to tapping and/or bending of the elbow, and changes in sensation. Other medical conditions may need to be evaluated such as thyroid disease or diabetes. A test called electromyography (EMG) and/or nerve conduction study (NCS) may be done to confirm the diagnosis of cubital tunnel syndrome and stage its severity. This test also checks for other possible nerve problems, such as a pinched nerve in the neck, which may cause similar symptoms. Treatment of Cubital Tunnel Syndrome Symptoms may sometimes be relieved without surgery, particularly if the EMG/NCS testing shows that the pressure on the nerve is minimal. Changing the patterns of elbow use may significantly reduce the pressure on the nerve. Avoiding putting your elbow on hard surfaces may help, or wearing an elbow pad over the ulnar nerve and “funny bone” may help. Keeping the elbow straight at night with a splint also may help. A session with a therapist to learn ways to avoid pressure on the nerve may be needed.